An op-ed from the International Development Secretary, Penny Mordaunt, has been published in today’s (Wednesday 21 November) Evening Standard. Every day millions of innocent children around the world experience unimaginable horrors because of war. Some have fled their bombed-out homes in the middle of the night. Many have witnessed their mothers, fathers, brothers and sisters killed in front of them. And when they have escaped conflict, many find themselves living in an unfamiliar world, where all sense of normality has disappeared. As well as the physical scars, many children will be living with the mental scars witnessing the terrible atrocities of conflict. As well as food, shelter and education, these children need mental health and psychosocial support – such as safe spaces – to help rebuild their lives, receive the opportunities they deserve and help shape their countries’ futures. The Evening Standard, in partnership with War Child, has rightly raised awareness of this important issue through their Learn to Live campaign. This government, through UK aid, is committed to supporting children who have experienced the horrors of war. This is why in September I announced that we would match, pound-for-pound, the first £500,000 donated by the British public to War Child for children in the Central African Republic. This is why we gathered children’s rights agencies to come together to commit to urgently tackling the issue during the first Global Ministerial Mental Health Summit in October. And this is why this government, through UK aid, will now deliver further support for children and young people in Jordan and Lebanon. Working with UNICEF in Lebanon, UK aid will deliver an education programme and provide psychosocial support for a further 10,000 Syrian refugee children and their carers. And my department will work with International Medical Corps in Jordan to provide specialised care to 2,400 children affected by trauma. We will also work to make sure that schools are safe, violence-free places for children to learn. 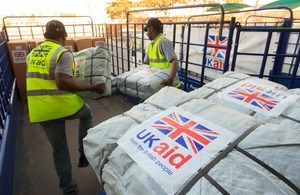 UK aid is already making a huge difference to the lives of children and young people in the region. We have supported over 116,000 vulnerable boys, girls and women in Lebanon to help them deal with trauma and prevent them being at risk of further abuse in the future. But there’s still much more to do to make sure that children’s rehabilitation – through medical and community support – is put at the heart of the international aid agenda when the impact of war is discussed. Because of war millions of children are growing up with high levels of stress and trauma, missing out on school and becoming withdrawn from their friends and families. We can’t let them become a lost generation. That’s why I want others to follow our lead in helping to rebuild the shattered lives of children and heal the mental scars of war so they can look forward to their tomorrow.